Welcome to the Akkhor Software Ltd Support Center. 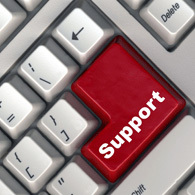 we know that our success depends on excellent customer support! In this fast paced world, changes need to be made quickly, communication and information exchanges need to be efficient and customers need easy access to important statistics. Conquest Internet Services (a division of Akkhor Software Ltd), has built a solid reputation for providing professional and personal service to our customers. Our customer support center keeps this strength in mind, while trying to increase your productivity by providing you with the proper support and information.